This is a recipe based off a food blog Shesimmers.com. I will emphasize lightly based – Leela is the real deal when it comes to Thai food recipes. (Later you’ll also see a Tom Kha Gai recipe based largely on her posted recipe.) I have been on a Thai kick lately. Mostly because minus the rice or noodles, it’s an incredibly Paleo-friendly cuisine with amazing coconut sauces and plenty of veggies. 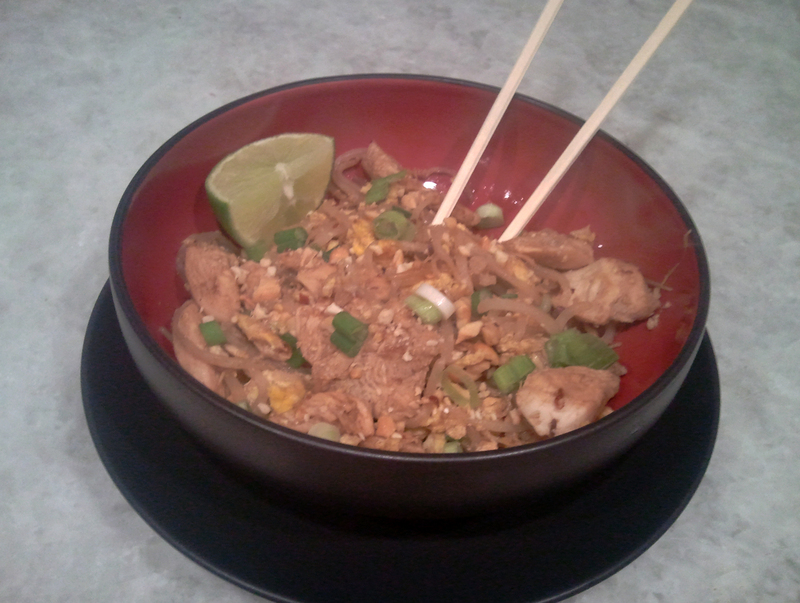 This chicken Pad Thai recipe is easy – it took me all of about 20 minutes to make this. You can make it even easier by buying an already prepared Pad Thai sauce (read the label first though!) but I’ve attempted to make my own. 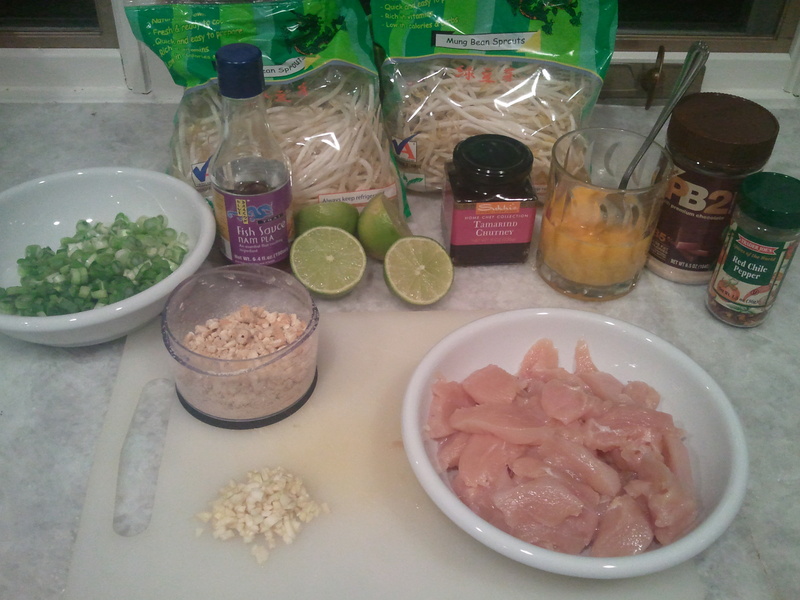 I started this off by making my own Pad Thai sauce – because I’m difficult. Of course, not having gone to a Thai grocery store, I was not able to find tamarind paste – so I substituted with tamarind chutney. I’ll explain why that did and did not work. I mixed a jar of tamarind paste with 1/2 c. of fish sauce. The chutney was not, however, sweet; in fact, it was salty. 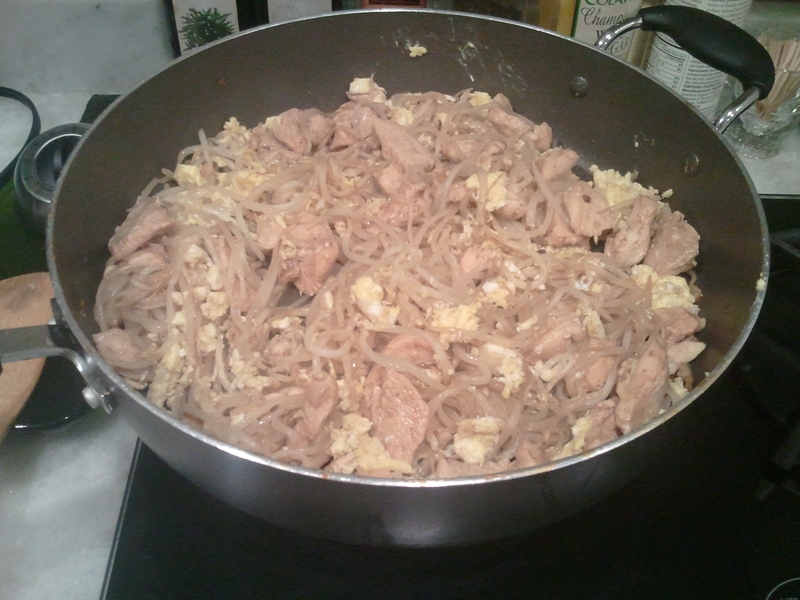 So my Pad Thai sauce was totally salty, lacking the balance of salty and sweet that a good Pad Thai should have. 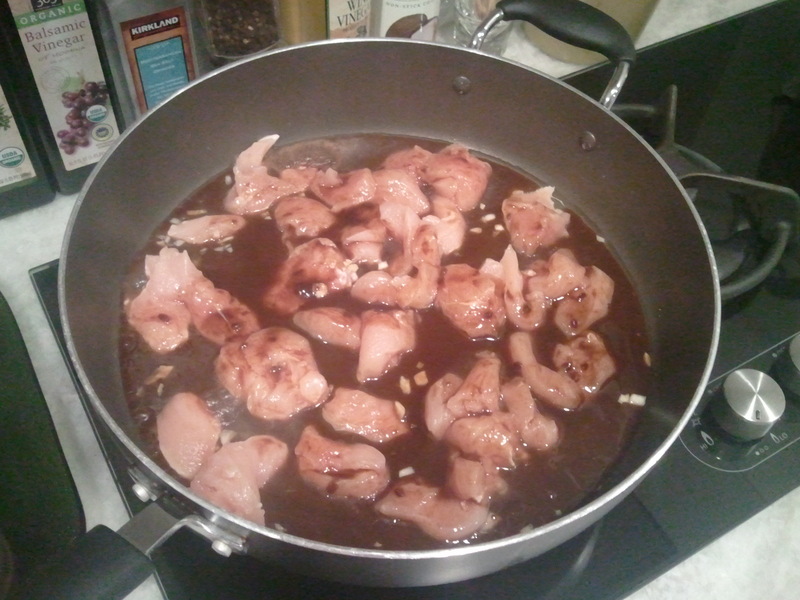 That could have been fixed by adding less fish sauce, a bit of water, and some sweetener (2 T. agave nectar or honey). Very fixable. For a tried and true recipe for Pad Thai sauce, use Leela’s Pad Thai Sauce recipe. Heat the coconut oil is a large saucepan over medium heat. Add the garlic, chicken and fish sauce. Turn the chicken as it cooks. 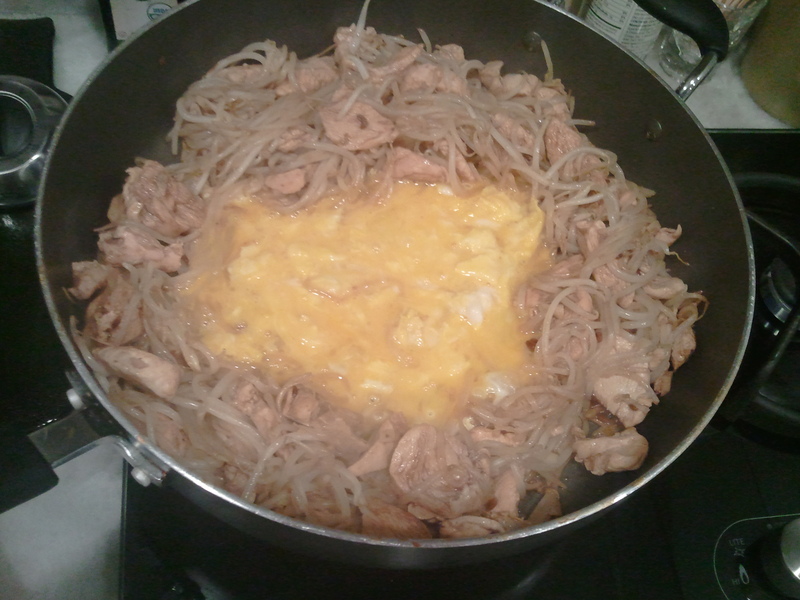 Add the bean sprouts to the pan and toss in the sauce. 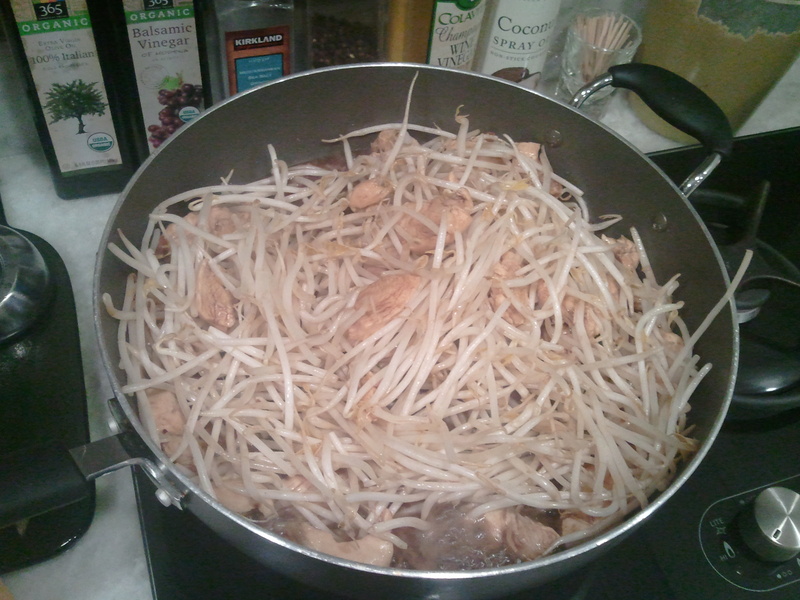 Cook the bean sprouts until they start to get tender. How will you know they’re getting tender? They bend easily. If there’s still a lot of liquid in the bottom of the pan, drain some of it into a bowl and set aside. Now, using your spatula, make a hole in the middle of the pan and pour the slightly beaten eggs into the middle. Use the tip of the spatula to move around the cooked part of the eggs until it resembles small cooked pieces (think small bits of egg in fried rice). Now, turn the heat up to high and allow everything to brown and crisp slightly on the bottom. I’m emphasizing slightly – too much would be, well, too much. One or two minutes will do. Add the chopped chives, chopped nuts, and red pepper flakes to the pan, along with a good squeeze from the lime halves. Toss lightly and you’re done! Share your tweaks – I’d love to hear about them. 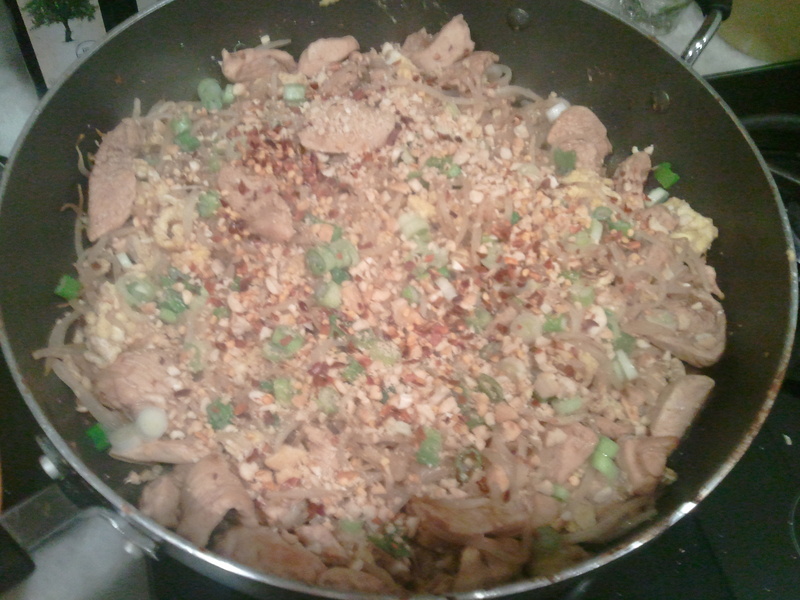 This entry was posted in chicken, main dish and tagged bean sprout, cashew, chicken, egg, fish sauce, pad thai, tamarind. Bookmark the permalink.